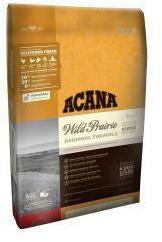 ACANA Wild Prairie Cat & Kitten food. Nature evolved your cat as a carnivore, designed to thrive on a diet rich and varied in meat proteins and fats - not grains and carbohydrates. That's why ACANA Wild Prairie features a rich variety of meats from cage-free chicken and whole eggs from local prairie farms, to wild-caught fish from our northern lakes - all delivered FRESH to nourish your cat completely. Grain-free to reduce unwanted carbohydrates, ACANA features regional vegetables, fruits and botanicals for a rich supply of natural trace elements and antioxidants. Made from Canada's best and freshest ingredients, ACANA keeps your cherished cat or kitten healthy and strong. Ingredients: COMPOSITION Fresh boneless chicken (18%), dehydrated chicken (17%), dehydrated turkey (9%), fresh boneless turkey (6%), chicken fat (5%), chickpeas, red lentils, chicken liver (5%), fresh boneless yellow perch (4%), green peas, green lentils, fresh whole egg (3%), herring oil (3%), alfalfa, dried kelp, pumpkin, butternut squash, spinach greens, carrots, apples, pears, cranberries, chicory root, dandelion root, chamomile, peppermint leaf, ginger root, caraway seeds, turmeric, rose hips, freeze-dried chicken liver, freeze-dried turkey liver, freeze-dried chicken, freeze-dried turkey.